Mary “Elnor” White was born on February 25, 1925 to Harold “Otto” and Violet Julia Buol White. She passed away on Thursday, January 31, 2019 at the New Homestead. Elnor grew up on a farm south of Guthrie Center. She graduated from Guthrie Center High School, Class of 1942. On August 20, 1955, she married Wilbur Knauss, who had 3 sons; Jerry (12), Jim (10), & Rich (7). They purchased a house on North 5th Street where they lived until they built a home (’74) on South 12th. Elnor lived in Guthrie Center her entire life, working at Eddie’s Super Valu for many years and Guthrie County ASCS Office for more than 30 years. Elnor was a loyal Iowa Hawkeye Football & Basketball Fan. 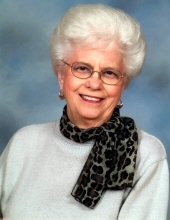 She was active with the Guthrie County Hospital Auxiliary, Member of St. Mary’s Catholic Church & she and Wilbur loved to go Dancing & Camping. She was proceeded in death by her Parents, Husband Wilbur (2003), Step-Son Jerry (2011), Granddaughter Kelli Ann Knauss (1979), Half Sister Helen Anderson, Half Brothers Arthur Wendt and Harold Wendt. Elnor is Survived by Step-Sons Jim (Kathy) Knauss of Lake City, Iowa, Rich (Ann) Knauss of Madrid, Iowa; Grandsons Dennis (Judy) Knauss of Greeneville, Tennessee, Pat (Marcy) Knauss of Burlington, Iowa, Granddaughter Jacki Knauss of Burlington, Iowa, Granddaughters Kim (Scott) Kelly of Lake City, Iowa, Nicki (Mike) Herbert of Guthrie Center, Iowa, Amy Davis of Excelsior, Minnesota, Kourtney Irlbeck of Carroll, Iowa, Jessica Hoffman of Urbandale, Iowa, Granddaughter Katie (Jeff) Mallory of Ankeny, Iowa, Grandson Andy (Candice) Knauss of Madrid, Iowa, 21 Great Grandchildren, 4 Great Great Grandchildren, Sister-in-Law Berdina Metz of Fairfield, Iowa, Many Nieces & Nephews. The Knauss Family would especially “Thank” The New Homestead for Elnor’s care beginning in September 2018, along with Hospice of the Midwest during the last week of her life. Thank You to Dr. Bascom & Dr. Ahrens for their Great Care over the years. In lieu of Flowers, the Family request a donation be made in Elnor’s Name to any of the following: Guthrie County Hospital, The New Homestead, Hospice of the Midwest, or St. Mary’s Catholic Church. To send flowers or a remembrance gift to the family of Mary Elnor Knauss, please visit our Tribute Store. Guaranteed delivery before Mary's memorial service begins. "Email Address" would like to share the life celebration of Mary Elnor Knauss. Click on the "link" to go to share a favorite memory or leave a condolence message for the family.